Styers Equipment Company is an experienced and reliable source for high-quality, new and used printing press equipment and accessories. We believe in what we do, and know that helping you find good printing and converting equipment helps your company realize its full potential. We are the complete package – the one-source solution for all your equipment needs. We aid our national and international customers in buying or selling quality pre-press, press, press accessories and finishing equipment. We also offer services that extend beyond buying and selling equipment. Our financial services include appraisals, equipment financing, and mergers/acquisitions. Our equipment services range from moving/installation to repair, retrofits and full equipment rebuilds. With our experience in asset management, engineering, mechanical support and design capabilities, we understand the market for printing and converting equipment from both a business and production perspective. This means that beyond the machines we offer, we can also help you realize the best return on the dollars you invest in your equipment. Paul Styers brought 19 years of printing and converting experience to bear when he and his wife, Diana, started Styers Equipment Company in January of 1983. He started his printing career in 1964, driving the company delivery truck. In time, he worked his way into production, learning every aspect from pre-press to finished product. Later he became the production manager and finally the general manager and president of the company. Styers Equipment Company, with experience in all phases of a printing concern, brings a unique combination to the equipment and machinery business. We understand production and the need for good machinery and equipment in order to produce quality products and meet production schedules. From a management point of view, we know the importance of return on investment as it relates to capital assets, cash flow and good financial statements. The company philosophy is simple. Take care of the customer’s needs on a timely basis, hire motivated people and reward their efforts, pay your bills, increase shareholder value through earnings and be a good corporate citizen. 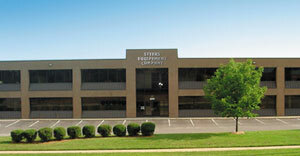 At Styers Equipment Company, the most important product we have to offer is service…service to printers and converters, both nationally and internationally, who manufacture consumer and industrial packaging and have a need to purchase or sell good pre-press, press, press accessories and finishing equipment. To our customers we pledge full disclosure of all pertinent facts relative to all sales and services. We commit to do everything possible to earn our customers’ respect and respond to their needs on a timely and effective basis. While we are a profit-oriented company, we well understand that profits are directly related to effort, intelligence, service and performance. To our employees we pledge compensation relative to performance. We believe in the dignity of the individual and take this belief to be essential and key to all human relations. To our vendors we pledge openness, willingness to listen, prompt payment and integrity. We appreciate the important contribution that vendors make to our company and welcome their participation and cooperation. To our investors and bankers we pledge to conduct our business in a profitable and professional fashion. We will ensure at all times that our stockholders receive a better than market return on their investment and that our bankers are paid promptly on whatever credit they commit to our use. To our country and community we pledge to be a good citizen and to preserve, protect, and build our republic as it pertains to individual freedom, opportunity, and responsibility. We feel that citizen involvement regarding governmental issues is a privilege, a right and a duty.